Malignant melanoma is the most serious form of skin cancer and the cancer form that increases the most among humans. It is strongly related to sun UV rays and repeated sun-burns. If detected early and treated early, 95% survive the disease. Therefore early detection is important. The disease is very rare before puberty and unusual during adolescence. Healthy sun habits are important during childhood, which reduces the risk of getting malignant melanoma when you get older. Uneven in color: for example, different shades of brown, black, red, pink, blue or white. Moles that bleed can also be signs of the disease. Common birthmarks, called nevi, are usually even brown in color and there is almost always a regular limit to the skin around. Wart like and hairy moles are rarely signs of cancer. Here you can read more about the ABCDE rule on changes in the skin. There are also other types of skin cancer. The most common form is basal cell carcinoma, followed by squamous cell carcinoma. I am a 40 year old female. Dark mole on my chest, present for a long time but has recently become bigger and more irregular. Width 6mm. Thank you for sending your case. 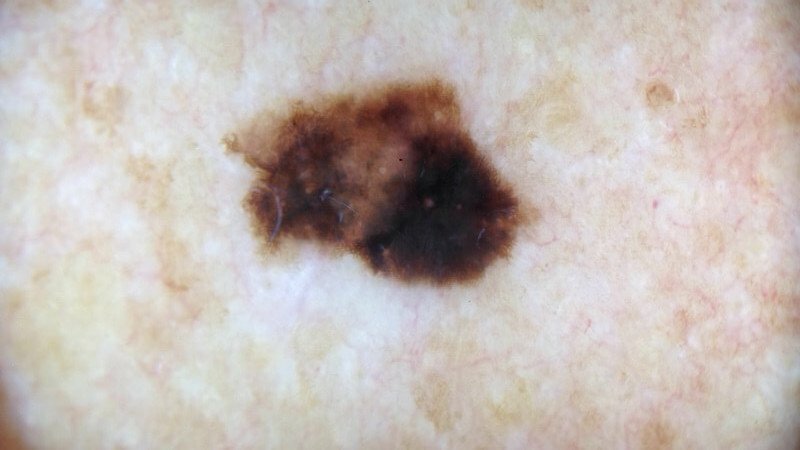 Based on the information and images, this is possibly a MALIGNANT MELANOMA. Melanoma is a type of skin cancer usually caused by excessive sun exposure, especially a history of sunburn(s). The pigmented lesion seen in the images is larger than most benign moles and also shows an irregular shape and multiple colors.  An urgent visit (within 2 weeks) to a see a dermatologist for closer examination with dermoscopy (a diagnostic technique with a specialized magnifying glass which allows for a more precise assessment) followed by urgent surgical excision is highly recommended. Thank you for sending your case. Based on the information and images, this is possibly a MALIGNANT MELANOMA: Melanoma is a type of skin cancer usually caused by excessive sun exposure, especially a history of sunburn(s). The pigmented lesion seen in the images is larger than most benign moles and also shows an irregular shape and multiple colors. Nevertheless, it is hard to be sure. It could also be a benign so-called seborrhoeic keratosis (benign wart). In any case, an urgent visit to a see a dermatologist for closer examination. I recommend that you store these images with this answer and bring them with you. Thank you for sending your case of your face. 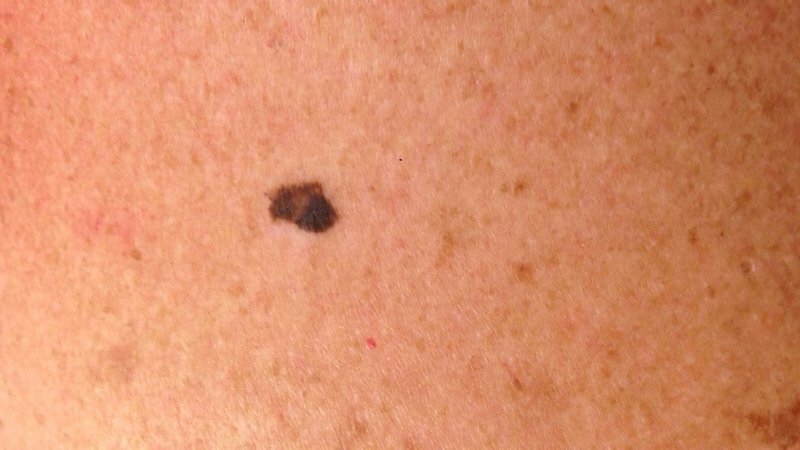 Based on the information and images, this is possibly a MALIGNANT MELANOMA: Melanoma is a type of skin cancer usually caused by excessive sun exposure, especially a history of sunburn(s). The pigmented lesion seen in the images is larger than most benign moles and also shows an irregular shape and multiple colors. Nevertheless, it is hard to be sure. It could also be a benign so-called seborrhoeic keratosis (benign wart). In any case, an urgent visit to a see a dermatologist for closer examination with dermoscopy (a diagnostic technique with a specialized magnifying glass which allows for a more precise diagnosis) s highly recommended. 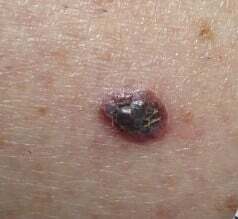 At this visit the other lesion should also be assessed since this also can be a skin cancer since it’s new and growing. I am a 49 year old woman. Location is right back of leg, dark red slightly raised in center surrounded by a light red color. The dark red part of the mole is 1/2 cm and 1 cm if you include the light red part. Not sure if the light red area is actually part of the mole or did I irritate the mole while wearing a pair of jeans and the light red area is a bruise around the mole. Thank you for sending your case of your leg. 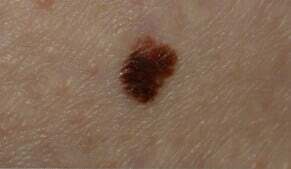 Based on the information and images, this is possibly a MALIGNANT MELANOMA: Melanoma is a type of skin cancer usually caused by excessive sun exposure, especially a history of sunburn(s). 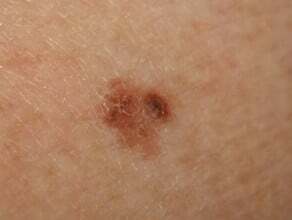 The pigmented lesion seen in the images is larger and darker than most benign moles. It shows a dark blue-red and black and colors with bleeding surrounding it. Nevertheless, it is hard to be sure. It could also be a benign mole that is very dark and bleeding but it is impossible to exclude without inspecting it with a dermoscope. In any case, an urgent visit to a see a dermatologist for closer examination with dermoscopy (a diagnostic technique with a specialized magnifying glass which allows for a more precise diagnosis) s highly recommended.